House windows not only play the role of safeguarding us from the adversities of natural and unnatural calamities, but it also adds to the beauty of the house to a greater extent. The windows must be built in a way that it protects us from the heat and cold weathers conditions and keep us safe inside our abode. The window shutters play a vital role in providing these benefits all in one go. They shield us from the climatic conditions outside and also increases the beauty of the entire household. 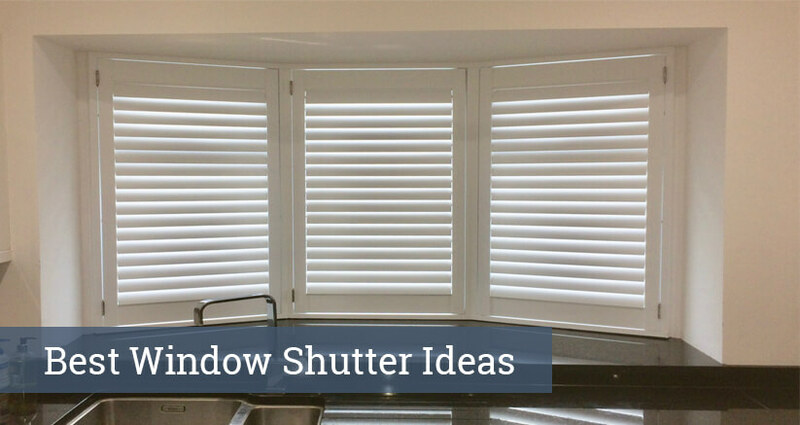 People, however, get confused as to which window shutters ideas are best fitted for their house because choosing the right kind of shutter is also important for executing the purpose. So, let us discuss the best window shutters available to fit houses of any kinds. Full height shutters are a type of shutter that meets the needs of all kinds of window styles. It covers the entire window pane and prevents the incoming light, adverse weather conditions and provides optimum insulation conditions as well. Moreover, the privacy protection is also guaranteed when you install the full height shutters on the windows of your house. Plantation shutters are shutters are so much more than just levying a beautiful outlook of the window design. They are a blend of modernization and traditional approach when it comes to window shutter installation. The shutter shields protect us from the scorching heat of the sun, wintry weather conditions, stormy rains, annoying noise from the neighbours and also from any other disturbing elements outside. As because these shutters are solid and strong enough to keep these things at bay and this is a better option for the private people to install in their windows. As is evident by the name, this type of shutter is made up of two-tier shutter panels that fit in a way that one shutter sits over the other. This kind of fittings of the window shutters helps in regulating the control of the shutters in a way you want it to regulate. You can either open it from the top or from the bottom; you can also open them together as is required in certain conditions. The solid shutters are made of wood panels which are entirely solid, which means they are free from any kind of slats or louvres. The benefits of this type of shutter are that it helps in preventing the excess light from coming inside the house, which, in turn, provides a better insulation to the house on cold days. Best suited for protecting the privacy of the house which is overlooked by strangers outside, the café style shutter is built in a way that it only covers the bottom part of the window. The upper part does not contain shutter panels, instead, they are made of a different kind of material other than the shutters, like glass, wood or anything for that matter. Though the privacy is maintained well through this type of shutter, the outlook of the window design also enhances a bit more in this shutter design. The bay window shutters fit the house of every kind, whether period or modern! If you are in fond of letting the natural light get into your house then this is the ideal option to choose from. Also, it shells out a better visual outlook of the window and has a better sense of the use of the window space. They are easy to install and so, the installation expenses are also cut down to lower levels. The most traditional and aesthetic form of shutters amongst all the types is the wooden shutter. It carries with it an aesthetically driven value that cannot be compelled with the modern shutter types. The materials used in making window shutters are diverse and is not only limited to fine wood only. For example, redwood, pine, cedar are some of the materials that are used in making the wooden shutters. Mainly used in the exterior designing of the window, they do not have to purposely be of the wooden shaped and coloured; they can be moulded into any shape and painted according to the liking of the clients. Window shutters are installed for serving us so many purposes and helping us in increasing the protection of our houses. If we don’t choose the window shutters properly then it can cause us more harm than benefits. These shutter types are the most preferred types in and around the UK. While choosing the shutters you must keep in mind that they are waterproof and shell out durability so that you don’t have to check on their maintenance frequently and enjoy the features for long.